Here, we examine how different emotions—happiness, fear, sadness and anger—affect the kinematics of locomotion. We focus on a compact representation of locomotion properties using the intersegmental law of coordination (Borghese et al. in J Physiol 494(3):863–879, 1996), which states that, during the gait cycle of human locomotion, the elevation angles of the thigh, shank and foot do not evolve independently of each other but form a planar pattern of co-variation. This phenomenon is highly robust and has been extensively studied. The orientation of the plane has been correlated with changes in the speed of locomotion and with reduction in energy expenditure as speed increases. An analytical model explaining the conditions underlying the emergence of this plane and predicting its orientation reveals that it suffices to examine the amplitudes of the elevation angles of the different segments along with the phase shifts between them (Barliya et al. 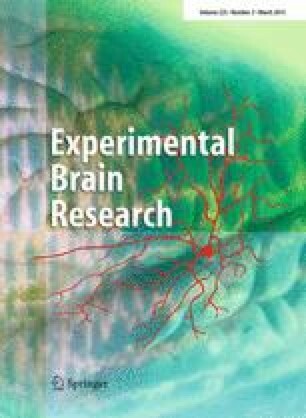 in Exp Brain Res 193:371–385, 2009). We thus investigated the influence of different emotions on the parameters directly determining the orientation of the intersegmental plane and on the angular rotation profiles of the leg segments, examining both the effect of changes in walking speed and effects independent of speed. Subjects were professional actors and naïve subjects with no training in acting. As expected, emotions were found to strongly affect the kinematics of locomotion, particularly walking speed. The intersegmental coordination patterns revealed that emotional expression caused additional modifications to the locomotion patterns that could not be explained solely by a change in speed. For all emotions except sadness, the amplitude of thigh elevation angles changed from those in neutral locomotion. The intersegmental plane was also differently oriented, especially during anger. We suggest that, while speed is the dominant variable allowing discrimination between different emotional gaits, emotion can be reliably recognized in locomotion only when speed is considered together with these kinematic changes. This study was partly supported by the grant EU FP6-NEST to Tamar Flash, Martin Giese and Alain Berthoz, by FP7 TANGO to Martin Giese and Tamar Flash, by the EC FP7 project AMARSI and the DFG for Martin Giese and the French NEUROPACT project support given to laboratoire de Physiologie de la Perception et de l’Action UMR7152 CNRS/Collge de France. We thank Claire Roether and Halim Hicheur for data acquisition and Winfried Ilg for help with the motion capture. We thank Dr. Jenny Kien for editorial assistance. Tamar Flash is an incumbent of the Dr. Hymie Morros professorial chair.